Few parents would admit to naming their baby after a hurricane. But unconsciously that might be exactly what many of us are doing — or at least appropriating the sounds of a name that, if the storm grows large enough, is uttered over and over on the news and in the course of casual conversation. According to Wharton marketing professors Jonah Berger and Eric Bradlow, that unintended impact of such natural disasters can tell marketers a lot about how the sights and sounds that we’re exposed to every day can impact our choices and, in turn, influence the consumer goods, music, movies and even baby names that become popular. Their paper, “From Karen to Katie: Using Baby Names to Understand Cultural Evolution,” is forthcoming in the journal Psychological Science. The research, co-authored by Wharton PhD student Yao Zhang and Alex Braunstein of app search engine Chomp.com, shows that this could be because what we’re exposed to on a daily basis changes how we feel about certain sounds and makes them unconsciously stick in our minds. In the case of hurricanes, they collected the names of all storms from 1950 to 2009, as well as the amount of damage each caused. More serious hurricanes are naturally talked about more, and according to the research, first names with similar sounds to those storms became more popular as a result. Both the statistical model and the hurricane experiment showed that the beginning sounds of names had a greater impact than the middle or ending phonemes on the future popularity of other names. There was also a point where widely used sounds began to suffer from over-popularity. Using a similar approach for naming a consumer product or predicting which songs will become more popular would be more difficult statistically, Bradlow says, because there are more extenuating factors involved. 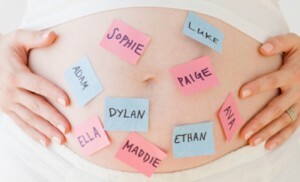 “People have no inherent strategy for picking a baby name,” he notes.